Whether you spent your high school years playing electric guitar too loud in the basement or playing classical music in your school’s band, you don’t have to stop the beat at GW. 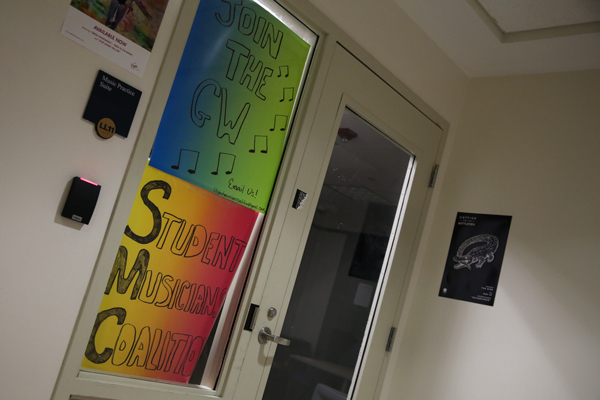 The Student Musicians Coalition is a group on campus that provides five practice music rooms in the basement of Shenkman Hall. The spaces are free to use and give students access to bass and guitar amps, a drum set and a PA system. The group also rents equipment to students to practice and perform anywhere they want. If jamming out alone isn’t really your thing, you can join a variety of student music groups, including seven a capella groups, an orchestra and a flute choir. GW offers classes in painting, drawing and other artistic disciplines. Any GW student can enroll in these classes, and most of them fulfill a G-PAC requirement for students of the Columbian College of Arts and Sciences. Students enrolled in those classes can access art studios, so you don’t have to worry about getting paint on your roommate’s side of the room. During the time you are enrolled in an art class, you can use the lockers in Smith Hall to stow your supplies and artwork. The Foggy Bottom campus doesn’t have much space for outdoor sports because of its location in the heart of D.C., but that doesn’t mean there isn’t a place for athletics at GW. Former all-star athletes can work out in the Lerner Health and Wellness Center, which houses a three lane 25-yard lap pool that is free to students, or ex-athletes can live vicariously through GW basketball players by attending games in the Smith Center. D.C. is also a prime location for runners. The National Mall makes a great running route, especially for freshmen, because it’s just four blocks down 19th Street from Thurston Hall. Endorphin junkies can also head down to Rock Creek Park to find some green space with longer running trails. If you’re an ex-athlete looking for some competition or camaraderie, D.C. has several popular running clubs, including the D.C. Road Runners and D.C. Front Runners. The groups typically meet a few times a week for distance runs and are open to all ages and abilities. Most groups even offer student discounts. For the dancers who want to do more than just twerk at a club, it’s easy to find ways to keep dancing. GW offers at least 15 dance groups that range in style from ballet to hip hop to cultural dance. If getting out into the city and meeting new people is more your style, visit a Northwest D.C. dance studio to take a class or join a performance group. Joy of Motion Dance Center is a short walk from campus and offers dance classes in more than 16 styles, fitness classes and groups that perform around the District. Joy of Motion offers drop-in classes, so you can choose how much time you want to commit.